I feel I should warn you before you do though. like their housetraining habits (or lack thereof)). Its mostly aimed at first-time ferret owners. But even experienced ferret parents should have a good time here. Go ahead, roam around. Discover every little nook and cranny of this site, just like a fuzzy would. All the ferret facts you ever wanted to know, including some fun ones. Proper ferret health care can significantly extend and improve your fuzzies life. Find out about ferret illness symptoms and how to care for your sick fuzzy. Everything you always wanted to know about pet ferret care...and more. Shopping for ferret supplies can be overwhelming. Check out my shopping list to make sure your fuzzy has everything he needs. Your fuzzy spends aprox. 20 hours a day in his ferret cage. Are you sure you bought the right one? Looking for fun ferret pictures? 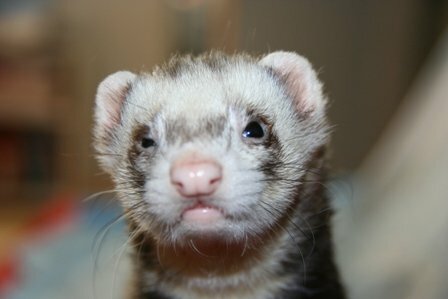 Why not add your fuzzies picture and enter the ferret photo contest? Read the Adopt A Ferret 101 site policies here. Want to adopt a ferret? What's that crazy noise my fuzzy is making? Why does my ferret bounce around like crazy? What do ferrets eat? You can find an answer to all those questions and more right here.